There will be no morning meeting at Grumpy's on Thursday, August, 25th, 2016. We will be having a Million Dollar Meal in the evening. Monday, October 12th--Come join us at West Dennis Beach for the Bob Stone Memorial Road Race. The race starts and finishes at West Dennis Beach. We will have an after party at the Sand Bar following the race. Students attending Dennis-Yarmouth Regional High School, Harwich High School and Cape Cod Tech who are residents of the towns of Dennis and Harwich are eligible to complete the attached scholarship application (link on the right-hand side). Please return your completed application to your guidance office by the deadline established by the school guidance department. Should any questions arise concerning the scholarship application process, please contact your guidance counselor. A Great Chance to See The Premier Event at the Cape Playhouse, "Hello, Dolly!" 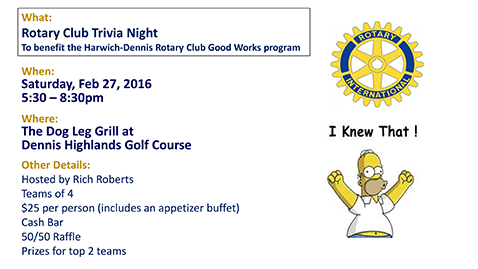 AND Support the Harwich-Dennis Rotary Club's Annual Golf Tournament. The Harwich-Dennis Rotary Club and The Dennis Police Association are teaming up for our First Annual Charity Texas Hold'Em Poker Tournament. The Tournament is Saturday April 12th--Registration Starts at 4:45pm with the Tournament starting at 6:00pm. 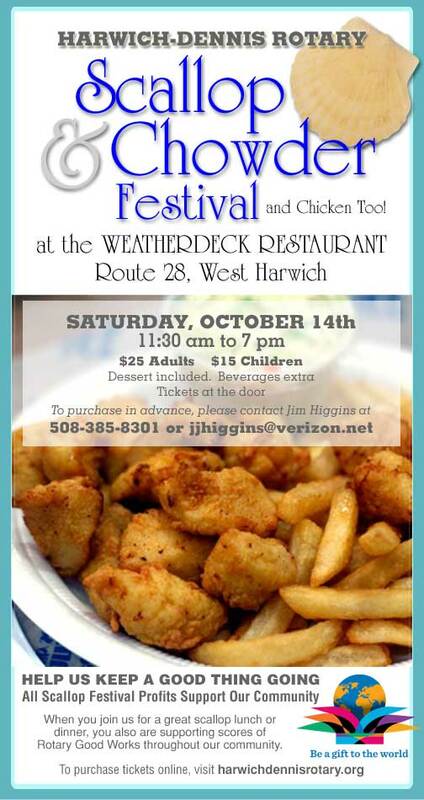 The Event will be at the SeaView in Dennisport. Player Entry Fee is $125.00/person which includes Buffet Style Appetizers, Dinner & Dessert. For those who want to watch, there is a Spectator Food Charge of $25.00/person. The Registration Form and additional information can be found here on our website. 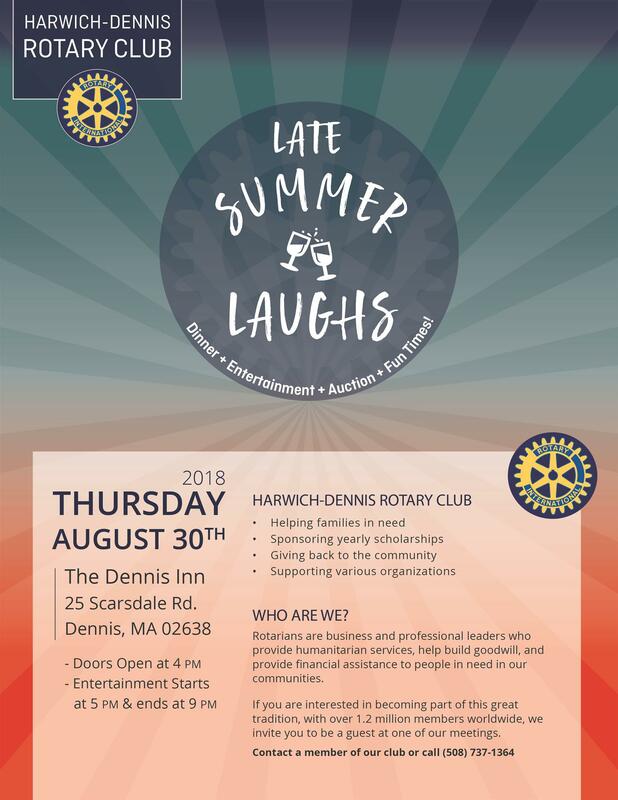 The Rotary Club of Harwich-Dennis has rescheduled our Annual Golf Tournament which was postponed because of a tropical storm. 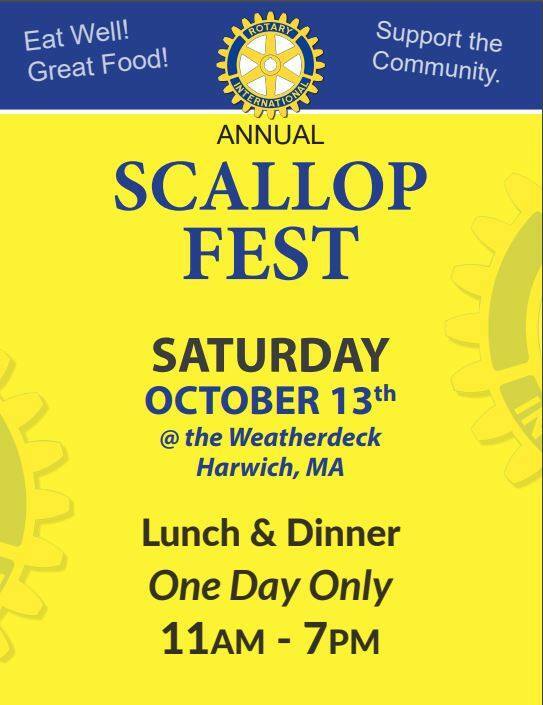 The proceeds of this event enables our club to continue the Good Works of Rotary in our towns and larger Cape Cod community as well as throughout the world.